"The tailor would over the years educate the customer"
About 100 years ago a man that needed clothes could do only one thing; go to see his tailor. Tailoring was a natural part of any man’s daily life and it was normal for everyone to build a relationship with their tailor. Much in the same way that people today build a relationship with the barber or hairdresser; you return to the same one if you are happy with the result and you either start relying on the barber for advice or your choose one that understands your needs exactly. Fathers brought their sons to introduce them to their tailor when they had reached a certain age, this ensured that an understanding of style and quality was carried on over the generations. The tailor would over the years educate the customer to become knowledgeable around issues such as construction, cloth weaving, etiquette, and wardrobe economics. "an understanding of style and quality was carried on over the generations." With the industrial revolution came the invention of ready-to-wear, and all of a sudden tailors were being replaced by shop attendants. They didn’t need the same level of knowledge since their main job didn’t involve construction of the actual garments. The tailoring trade started seeing hard times and the profession started to appeal to less and less young people looking for a suitable career. As the general knowledge about tailoring started to decline the importance of branding started to increase. Clothes and suits especially, were still a key sign of social status and hence the fashion industry started to play on factors that were easier to convey through mass media and advertising. Tailoring houses were suffering across the world, and by the end of the 20th century there was only a small number of tailoring houses left in Stockholm. One of them was Götrich. For the generations born in the 60s, 70s and 80s, the allure and romance of mass production eventually started to fade away, especially with the realisation that quality and price wasn’t necessarily correlated. Strong brands started to market average quality products at premium prices, and when the digital revolution made information available to everyone it started to dawn on people that you don’t always get what you pay for. "Consuming authentic products and services in an informed way has also become a true sign of sophistication"
With the growing prosperity and influence of these generations we have seen an amazing up-rise in the market for “real experiences”. Bakeries with their own sour dough based breads, micro-breweries with beer that has a unique character, restaurants that inform guests about the origin of the produce on the plate, and real leather shoes that are stitched by hand by an actual cobbler are all examples of products that have seen a return to the commercial realm over the past 10-15 years. Consuming authentic products and services in an informed way has also become a true sign of sophistication, and with that the once strong brands that have been willing to set aside their quality ideals have many times lost in credibility. "guaranteeing fit and quality that is otherwise unattainable"
The art and craft of tailoring is hence on the rise once again. The willingness to invest time and dedication to understanding the dimensions that affects the quality and style of a suit is back, and with the introduction of the internet and social media the sources of knowledge are now available to all. Men are once again getting accustomed to the idea of building a relationship with a tailor that understands one's needs and preferences while guaranteeing a fit and quality that is otherwise unattainable. 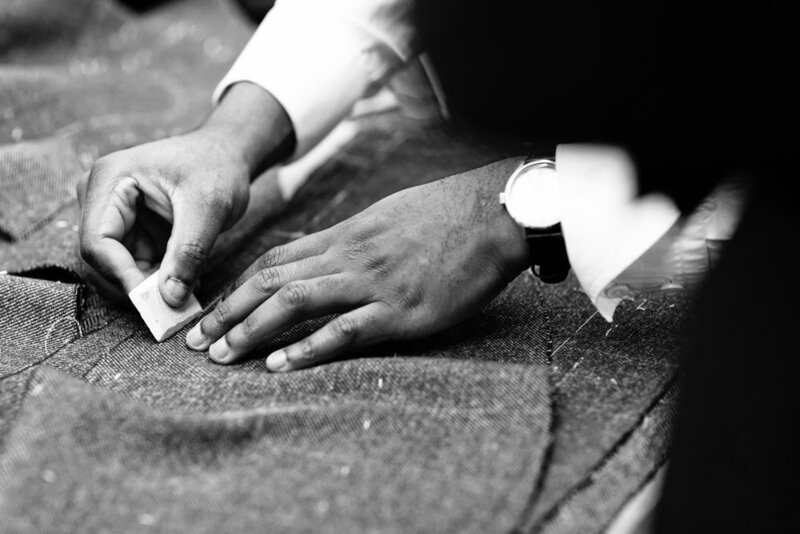 The bespoke tailoring process, as described in one of our earlier blog posts, is a truly interactive process that allows for an endless amount of personalization and a possibility to express one's true style and ideals. A well-tailored suit is as far away as you can get from branded, in-your-face status symbols, but still speaks volumes in all its subtlety. It is a real experience that is re-created every time you pull your suit from the wardrobe. "At Götrich we are more than happy to be your trusted tailoring partner"
At Götrich we are more than happy to be your trusted tailoring partner. Both if you are looking for a source of knowledge or if you are just looking for someone to guide you through your process, we will ensure the necessary skills, know-how, craftsmanship and understanding of traditions and etiquette to make the garments you want and need. Whether you are looking for the office staple, the wedding suit, the autumn tweed or the black tie for New Years Eve, we will make sure it becomes what you want it to be. We are on a quest to re-establish the art tailoring in Stockholm, please feel invited to join us in that pursuit!